Yoga at IX Art Park! What is community acupuncture? Community acupuncture is acupuncture in a group setting in which multiple patients receive treatment while relaxing in reclining chairs. Treating multiple clients at once reduces expenses, making it more affordable for you! Does it hurt? Acupuncture needles are extremely thin (about the width of a cat whisker), and there may be a brief, pinch-like sensation but generally nothing more. During a treatment some people experience a spreading warmth, others a dull, achy sensation or a feeling of fullness or heaviness. Most people find acupuncture very relaxing and often take a nap during their session. Why should I try acupuncture? How often do I need to go? 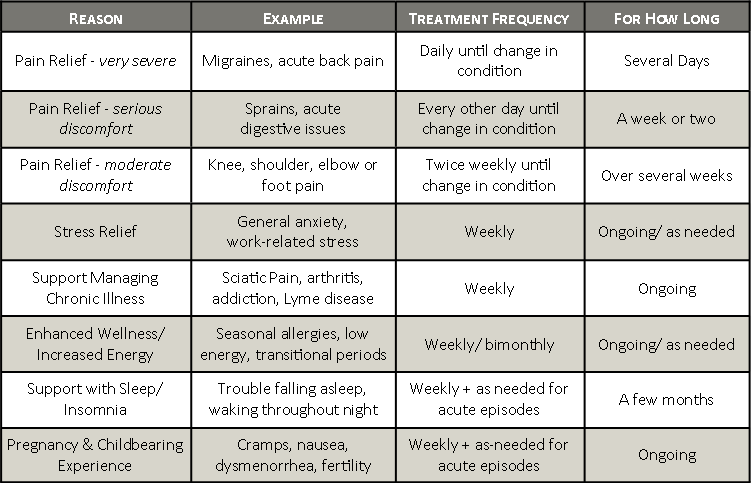 See the chart below for reasons and examples of why people seek acupuncture, and some general guidelines of treatment. Will I feel the benefits immediately? Possibly, but it is very rare that a problem can be resolved in one session. Acupuncture is a process. If you don’t come in often enough or long enough, you may not achieve the full benefits. The purpose of our sliding scale is to help you make that commitment. What do I wear? Loose clothing: pants and sleeves that can be rolled back. The acupuncturist might need to reach some points on your knees or below, on your forearms, or along your collarbone. How much does it cost? Community Acupuncture sessions at Common Ground are Pay-What-You-Can $20-$60. Your first Community Acupuncture session requires a $15 Consultation Fee, making your first session Pay-What-You-Can $35-$75. How long is an appointment? Your first appointment will probably be around 90 minutes, including the paperwork which needs to be completed before your first session is scheduled to begin. Subsequent appointments will probably be about 60 minutes. I just scheduled an appointment. Why does it say my appointment is only 10 or 20 minutes long? We schedule returning clients 10 minutes apart. This is what makes community acupuncture affordable, and the reason that arriving on time is very important. New clients are scheduled in for 20 minutes so that you have a bit more time to meet the acupuncturist. This longer first session is also why we charge that $15 Consultation Fee for your first visit. How do a I schedule an appointment? To schedule an appointment, call us at 434-218-7677 or book from here. Anything else I should know? If it is your first appointment, please arrive 15 minutes early for first-time paperwork. This first-time paperwork is also available online from here. 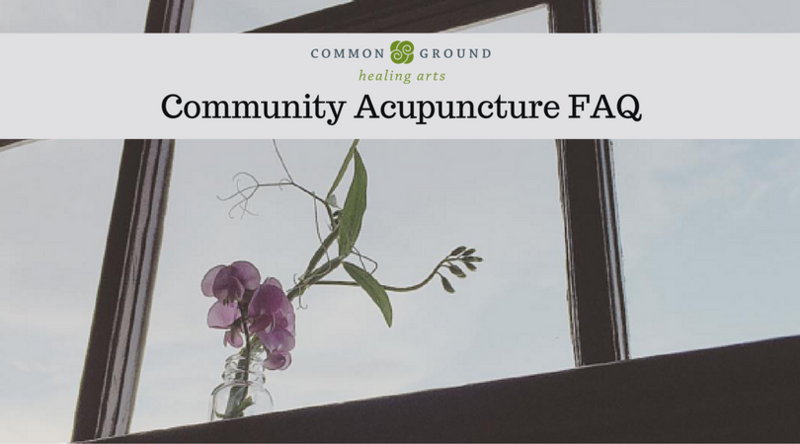 Additionally, here are 11 things you need to know before your first Community Acupuncture appointment at Common Ground.We’re glad you’re coming to try acupuncture! Looking for more information on acupuncture?